Here’s a bit of irony for you. 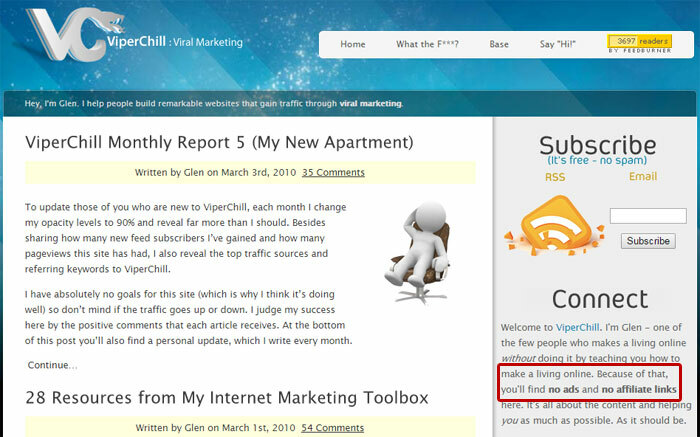 I’m re-launching what I called in a previous blog post the “World’s worst email list” and I would love for you to subscribe to ViperChill for future updates if you haven’t already. Every week I will be sharing with you, in great detail, at least one unique niche idea that you can use to start generating an income online. The emails I will send are a refresh of the “cloud niche” emails I used to send previously which received over 1,000 replies just with the words “thank you” in them. I won’t just be saying things like “Start a car forum” but getting into examples of people doing well in the niche idea I share, how I would go about marketing it and the specifics of the type of website I would build as well. I’ve already written the first few ideas in the series – I shared them elsewhere online under a psuedo name (long story) – so they’re ready to go. If you’re reading this article on ViperChill.com you can enter your email address in the right sidebar opt-in box or the one at the bottom of this articles to subscribe (if you haven’t already). If you’re reading this in a feed reader or in your inbox, you can subscribe via this page (I know it has nothing to do with the list, but I don’t have a dedicated page yet). On my previous email list with a similar focus I had sent 9 unique niche ideas over the course of a few months to tens of thousands of people and each email received dozens if not hundreds of positive replies. I stopped sharing those niche ideas because I, mistakenly, thought that nobody took any action on the ideas I was sharing. I didn’t want to keep sending ideas that people weren’t doing anything with and possibly distracting them from what they were already focusing on. I received quite a lot of emails after my list-closure announcement from people who really didn’t want me to stop sending them and more importantly said they liked the updates because it gave them new ideas to try in their own niche or new angles they could consider. I really saw this take place when I started my “Viral Nova series” showing people the potential of sharing viral news on Facebook. I have received more success story examples from this series than anything else I’ve ever written about. Very few are from people who followed the Viral Nova example to a T. Most are from people who took the examples I shared and added their own spin to them. The owner of Viral Hoops, a basketball inspired viral news site, is now getting millions of pageviews per month. Another example that recently arrived in my inbox – which I sadly don’t have permission to share – is getting 17 million pageviews per month (!). They took the concept, changed the audience they were targeting by language, and are making a killing from doing so. I want to see more of that, and that’s how my new updates will change. I’ll continue to send ideas and information about industries I believe are highly profitable but they’ll also be written with the hope that you can just take something from the concept and apply it to an industry you’re already interested in. Whether that’s a marketing idea, niche idea, or angle you can apply to a industry you truly care about. So, if that sounds like it’s for you – and I hope it does – then you can subscribe to my email list in any way you wish and you’ll get those updates. One big change – at least I think so – is going back to ViperChill “roots” and removing credit from all affiliate links on this site and denying any future affiliate promotion offers. There are a few reasons I’m doing this. One possibility which may come to mind is that removing affiliate links will make me seen as more “trustworthy”, but it’s not really my motivation. Instead, it’s really about going back to the ‘core’ of what makes ViperChill well…ViperChill, and that means putting everything into my own content which I share. The message is clear: Focus on the content and forget the ads and affiliate links. Another benefit to making my removal of affiliate links clear is to give a straight answer to the many emails I receive. I get pitched affiliate offers and “unique opportunities” on an almost daily basis and I generally respond with why this isn’t for me and so on. It takes a lot of time to do this and I would rather it be clear that I’m simply not doing any affiliate promotions. Don’t get me wrong, I don’t think there’s anything amiss with being an affiliate for products and services; I’m certainly not stopping them on other websites I run. Just for me, in this industry, it’s not something I want to be associated with. This it not just some spur of the moment change. A few months ago I promoted Pat Flynn’s Smart Podcast Player and did not receive a single penny from that despite generating more than $10,000 in sales. I haven’t even spoken to Pat since then, so it’s not like I did it to get something in return. It was (is) just a great product I was happy to share. My biggest affiliate commission from this site was undoubtedly from the Stack That Money Forums. I’ve already emailed the STM guys about not wanting any future commissions paid out and they thought I must have some sort of problem with them. Far from it; STM is still – by far – the best forum I’ve found for people looking to make money online. I’ll still link to them, like this (not an aff-link), but I don’t want any credit for it. It’s probably a really stupid short-term business decision – I make a few thousand dollars per month from that link on autopilot – but I don’t really believe in saying, “let me remove these Aweber links but I want credit if you sign-up to STM because that’s erm…different“. I dreamed about making thousands of dollars per month online when I first started out – it’s far more than I was making hanging clothes at TK Maxx in Newcastle – but it’s something I’m willing to forgo for my own weird reasons. I honestly have no explanation for this but people seem to want me to continue with my sporadic podcast updates and share more of my content via the medium. The reality is that I don’t update my podcast very often because I’m terrible at thinking live on the spot, especially in situations where I know what I say could be – and has been in a few months – downloaded by more than 100,000 people. It’s not that I can’t talk about marketing – I can – it’s just that I’m more afraid that during an “off-the-cuff” podcast I’ll ramble too much on one point and forget other points I really want to make. I know I can make notes before a show but still, I feel like podcast listeners would rather hear something said once, fairly eloquently, than having me ramble on the point for five minutes. To me, the act of podcasting really goes against what I believe makes good writing. With writing you get everything out there in the open onto the paper or screen and then you can go back and edit and fix things later. When you’re working with an audio file it’s much harder to remove mistakes or say something in a different way that doesn’t sound right when you hear it again. As a side note, I remember listening to one of Chris Ducker’s podcast episodes where he started the show by sharing a negative review he had received on iTunes. The review basically says he rambles too much in his shows and doesn’t get to the good stuff (his advice / interview content) quick enough. I really liked that. But, again, for the kind of topics I’ve covered on my podcast previously – usually actionable advice rather than interviews – it makes sense to say something and then move onto the next segment. I like the lifestyle associated with making money online but I could never cover it like the guys at Tropical MBA do. I love interviews with entrepreneurs (even if I prefer reading them) but I couldn’t ask questions or relate to guests as well as John Lee Dumas, Yaro Starak and Pat Flynn do. I enjoy the process of blogging, growing blogs and the vast platform customization available – but I couldn’t cover as many angles as Ramsay at The Blog Tyrant does. Ramsay, consider this a push to get publishing new episodes again! I like to see improvements in my own writing ability but Jeff Goins’ podcast takes the subject to levels I’ve never really even considered and are far out of my own personal experiences. I have bought and sold a lot of websites and learned a ton in the process but I will never be into it as Justin and Joe at Empire Flippers. My “problem”, which I hope to make your own gain, is I constantly find too many ideas in industries I would love to dominate. Ideas which have great income potential but would distract me too much from what I’m already working on. So, my new podcast refresh will be sharing those ideas, as I plan to do via email, in great detail. There have been a few other little changes around here which barely need mentioning. I updated the Favicon and made it a little clearer. I removed ‘Viral Marketing’ from the title tag not because it didn’t send me a ton of traffic but because I’ve written about the topic, partly, in exactly two blog posts. I also removed the toolbox link in the navbar here because the page hasn’t been updated in a while and doesn’t represent the tools I’ve been using the most in my business. I plan on revamping the page and putting it back in the top links. I said in my last post that I had decided to start a new website in an industry I love but didn’t know exactly which angle to take so started out as a news / blog site but didn’t know if I would continue down that route. The most important thing was, and always is, that I just did something. The rest often figures itself out. After a few weeks of brainstorming potential future concepts a good friend of mine gave me an incredible idea that can take this site forward. Not only does it provide a solution that I would be looking for in this particular industry but offers a solution which I think millions of people would love to use. It’s one of those ideas where I don’t even care if it’s profitable, just something you know you have to create. I haven’t given away many details on this new site – besides that it’s growth is primarily driven by Facebook – but things are going very well. It’s not a huge secret; quite a lot of friends and acquaintances in the IM world know about it, but I would like to keep it semi-private for now while we’re in the growth stages. The cost of this new project, at my last count, was around $8,000 invested. Now I would say it’s closer to $12,000. I know that’s a small sum for some but for the majority of people I imagine reading this $12,000 could be seen as a huge investment, especially when there is no sort of guaranteed return. In all honesty I could have achieved very similar results with a figure closer to $3,000 knowing what I do now. I hope to share some of those insights in my next post where I continue my Facebook series with an in-depth guide to running ads there. The site is in an industry I tried to conquer about seven years ago with one of my first sites. I had no budget to promote it back then so it quickly died in place of other, cheaper ideas. My interest in the topic has only grown though, and it has resulted in constant thinking about my niche. 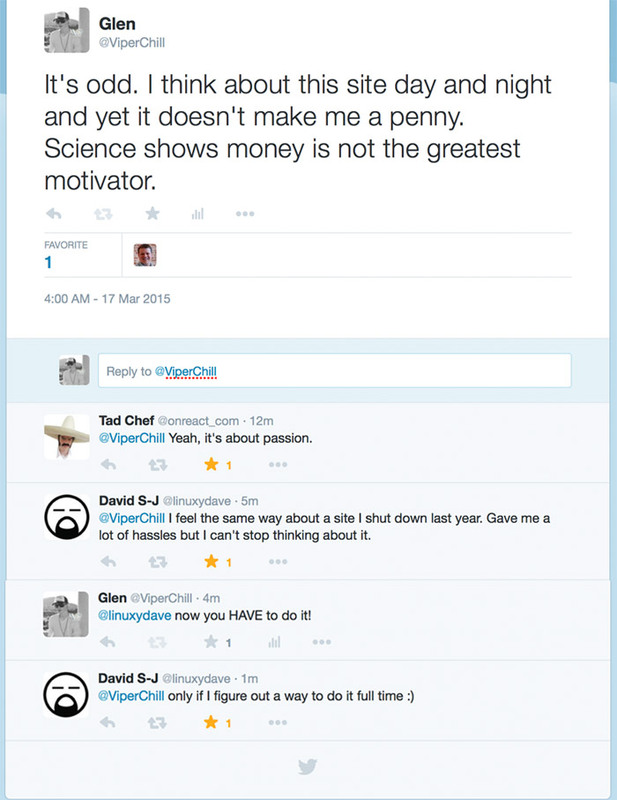 David touches on a great point here that partly addresses why I haven’t talked about this site more: If you don’t see any way of turning your passion into income it can be hard to get going. I don’t really have a solution for this; it certainly helps if your main passions are in industries which have the potential to be hugely profitable online. I do have a recommendation though: If you don’t see direct income potential from a niche you truly love, step back a category level. So for instance if you’re interested in bespoke office chairs like the $1,000 Aeron but aren’t getting much affiliate traction, get into the office design niche. Or the next category up, general Interior Design. Oddly, the more you work on an industry that is just outside of what you really love, you begin to fall in love with it at as well (at least, in my experience). 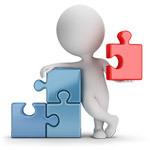 It’s so close to what you really care about that you find it interesting to keep finding new connections in the niche as a whole. There is also a good possibility that broadening your focus a little could result in you being able to narrow it later. Your interior design posts could get noticed by a media buyer at Ikea which lands you a deal designing their next custom office chair series. I know that’s a huge jump and likely unrealistic example, but you never know where you can end up if you just get started with something. You’ll get a lot further than having never started. As mentioned a little earlier, a huge portion of the traffic to my site is from Facebook. From the strategies and advertising tactics I’ve learned, I’m able to reach millions of people week after week. While that graphic might look impressive, it really doesn’t matter if I have 1,000 likes or 1 million likes. If I’m not turning that reach into a profitable business it’s just a side hobby I pay quite a bit of money to participate in. I imagine most of you are here to actually start or grow a business that actually makes money so my results so far are largely meaningless. For that reason, I’ve been a little more quiet on the site and its results. Having hundreds of thousands of likes or reaching millions of people doesn’t mean a lot when I don’t have a penny to show for it. I believe I will, but it hasn’t happened yet. At the beginning of next week I’ll be starting a direct mail campaign which aims to entice potential advertisers to pay to be on my site. If you would like to see how this site develops, please do sign-up to my email list. Not only will I be sending you those exclusive niche ideas (which won’t be blog posts) you’ll also get notifications of all future blog posts. One of the blogs I have really enjoyed reading recently is that of Tyler Cruz, a self-styled internet marketer who is very transparent about his online success and failures. Tyler’s site has ads, accepts paid articles, has spammers abuse his “top comments” widget and heavily promotes affiliate links, but he’s as personal and honest as they come; and that’s pretty rare. Not only will he go into his health problems in such honest detail but also shares his ventures in real estate investment (paid for with affiliate marketing). He even posts income reports which I know a lot of people like, even if they are a few months delayed. Quite simply, you can relate to him. For those reasons and many more, I highly recommend you give his site a read. This probably sounds like a paid promotion, but the last time we talked was in 2013 when I asked for his help to get into an ad network. If you like reading articles from people like Joel Klettke, John Lee Dumas, Pat Flynn, Ramsay Taplin, John Doherty, Lyndon Antcliff and others, you’ll enjoy his work. I often say that whenever I turn off the comments here, which I have, it’s to direct people to a certain link or to take a certain action. While I really want you to sign-up to my email list if you haven’t already, I’ve linked to a lot of other people in this post and really hope you check out their websites when you have the time. Linking out so much is pretty rare for me. I generally link out where I feel a link is relevant but never talk about “competitors” as much as I should. As it took me a long time to learn, linking out to others doesn’t mean you’re helping them rank higher in Google, losing readers to them or should expect to get something in return. Surprisingly, sharing the work of others shows your audience you know so much about your topic that you know who the great people to follow are. We should all do more of that. In the world of easy Facebook likes, clicks for Google +’s and one-tap Follows, a real personal recommendation at the heart of the content you want to share means more than anything. Forget Google; I like the personal side of it. It’s more than just a “how are you?” on Twitter with someone you don’t really know on any other medium. Thank you for reading. I really hope to see you again here very soon. P.S. You may remember my Find Similar Pages trick from my last two posts. While it helped, the process was a bit time consuming. Well, thanks to Chris Fong, that find similar pages trick is now a Chrome Extension. It works perfectly, just keep in mind it only displays (as it should) when you’re on a Facebook page. What’s more impressive to me is that Chris had never built a Chrome extension in his life before sharing this with the world. What a great example of having an idea and being willing to put in the work to make it happen. Thanks Chris! You’re probably not as curious as I was but Google Translate gives you, “Glen has a proven track record as a SEO marketing reader , I am also includes a number of information sources . He is also my good friend”. Though my girlfriend tells me you wrote my name as “Kuren” – 😉 – I appreciate it. Thanks Steve!